Councillor Peter Purvis died on Thursday following a short illness. The 79-year-old, whose wife Geraldine is a fellow Councillor in same ward, was first elected to Middlesbrough Council in 2007 in the former Thorntree Ward. Cllr Purvis was an active member of Community Ventures Middlesbrough and also sat on the River Tees Port Health Authority. He was Vice Chair of the Council’s Corporate Affairs and Audit Committee, a member of the Overview and Scrutiny Board and sat on the Adult Health and Social Care Scrutiny Panel. Middlesbrough Mayor Dave Budd said: “Peter was a true gentleman whose passion for the community in Thorntree and East Middlesbrough dates back many, many years. “He was a great advocate for his ward and for the town as a whole, and I greatly enjoyed our frequent conversations. “It is people like Peter who help to bind communities together, and his dedication and commitment made a real difference. 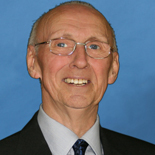 Cllr Purvis’s funeral will take place this Friday (November 2) at 9.30am in St Bede’s Chapel at Teesside Crematorium.